Note : If You stay on Gili Islands, we will pick up in Bangsal or Teluk Kodek harbor! The Rinjani volcano trekking Lombok is a great adventure activity you do not miss during in Lombok. We work with professional trekking team in Lombok including experience trekking Guide. 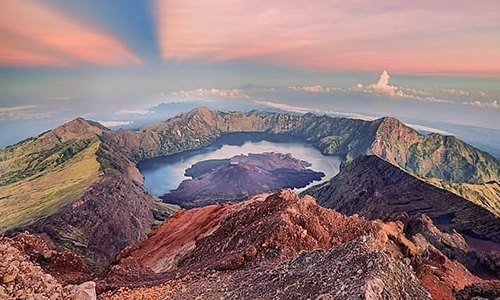 Rinjani volcano is the second highest mountain in Indonesia with the height 3.726m from sea level. The trekking can start from two sides, first from Senaru in North Lombok and the second from Sembalun, East Lombok. Rinjani trekking tour packages are offered with free hotel transfers in Lombok, Bangsal, Lembar, and Lombok Airport. We also provide a one-night free accommodation in Senaru and Sembalun. Hotel or Airport transfers and then drive to Senaru, it takes about 2 hours from Senggigi. You will have the night accommodation in Senaru, then early morning on the next day you will start the trekking. DAY 01: After breakfast, you will start tracking from Rinjani Track Centre in Senaru at 07.00am. Hiking for 5 hours to Base camp III, you will have a rest and having lunch here. After lunch, you will continue to the crater rim for a spectacular view of Segara Anak Lake and having the sunset. You will overnight here and dinner will be served at 07.00pm. DAY 02: Having a beautiful sunrise on Segara Anak lake, and then have breakfast. After breakfast, you will continue to Segara Anak Lake. You will have a rest at Segara Anak Lake, take a cool dip into the lake or just take relax in the natural volcanic hot springs. You can also take pictures, after that having lunch. At 2:00 pm, you continue to Sembalun crater rim, overnight here for the second night. Dinner will be served at 07.00pm, you need to sleep early here for the next early morning trek. DAY 03: At 03.00am, you will continue to the summit of Mt. Rinjani. 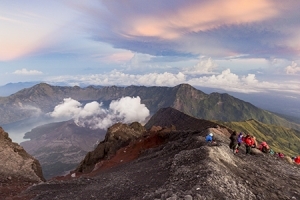 You will reach the 3.726m Rinjani summit into 3 hours hiking, so you will be there about 06.00am. After that, you will continue to Sembalun Rim, you will have breakfast at 10.00am and have a little rest. After breakfast, you will continue down to Sembalun Village for 4 to 5 hours. The car is ready for you at Sembalun Village, drive you to Senaru and then Senggigi. Hotel transfers for Senggigi, Bangsal, Teluk Kodek. Guide, porter, food & mineral waters. One night accommodation in smart, before start Tracking.